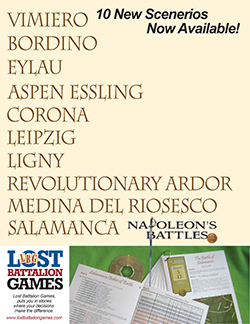 Lost Battalion Games has published 10 "New" Scenarios for Napoleon's Battles 3rd Edition (NBIII). The Scenarios have been designed so their look was consistent with the new NBIII. However, actually only one Scenario (Medina del Riosecco) is new. The rest have been published in the 1st Edition, NBI and its two expansion modules (Red and Blue books) or in the 2nd one, NBII. In order to have a better view, I have made a complete (I hope!) relation of the "official" Scenarios designed for Napoleon's Battles, i.e. those endorsed by Coggins and Craig.